The last day of January marked the first day of the Lunar New Year, a celebration and time of renewal in many Asian cultures. Resolutions aren’t part of the Lunar New Year tradition, but I have grown to appreciate it as a reminder that Jan. 1st is not the only day of the year on which to make resolutions. I would like to offer one, which I hope bankers, mobile money issuers and financial regulators will consider adopting, which for me was the key takeaway as a panelist on behalf of IMTFI in last year’s Alliance for Financial Inclusion (AFI) Global Policy Forum (GPF), held in Kuala Lumpur, Malaysia. AFI is a network of central banks and other financial regulatory bodies from nearly 60 developing countries who exchange knowledge on financial inclusion policies. Our panel on “Research Findings in Financial Inclusion” focused on bringing to policy makers the latest research in the field of financial inclusion. First to present were Nina Laven and Nurina Merdikawati of INSEAD, who did a research on payment risks and security. Their study brought out three related insights: (1) interoperable systems pave the way for payment security; (2) security is key in building consumer trust; and (3) trust, in turn, is key to new technology uptake. They found that isolated technology platforms were not necessarily more secure and that those countries with interoperable payment systems have a better chance to have a significant level of consumer adoption for financial services. From the emphasis on trust, I segued into the need for technology-driven payment alternatives to be contextualized to local conditions based on findings from my IMTFI case study of Green Bank’s text-a-payment loan facility. I explained that integrating mobile technology into bank services will not necessarily lead to financial inclusion and encourage savings buildup, particularly if initiatives fail to address the human and organizational aspects of financial transactions or rectify problems with interoperability. There was little uptake in the use of the mobile money that could run in the bank’s platform as it only worked with mobile phone users subscribed to one specific mobile network operator, limiting the ability of clients to perform their day-to-day transactions with merchants or family members subscribed to other telcos. 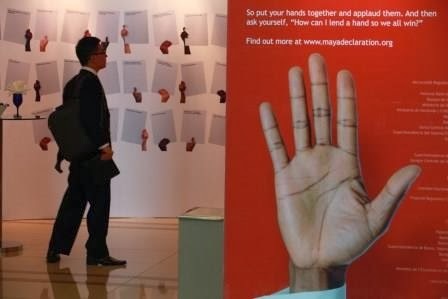 Jing Gusto next to the Maya Declaration sign, "How can I lend a hand so we all win?" Finally, Aishwarya Ratan of Innovations for Poverty Action, presented how IPA’s study on commitment savings in agriculture in Malawi highlighted the need for a financial environment that fosters diversity in services and delivery channels and more sensitivity to user types to promote financial inclusion. The panel discussion highlighted inter-linkages and complementarities between financial inclusion, security, and diversity in local context and user types. Overall, I think it emphasized the need for interoperability in reducing the dependency on cash for payment transactions, which is integral in enabling inclusive economic development and poverty alleviation. Alternative modes of payment and value storage remain second to cash largely because they are missing one important ingredient, and that is the ability for users to readily transact for their day-to-day use, anywhere, anytime. Regulators and private players in the financial and telecommunications sectors need to think outside the box and find ways for their respective payment/financial platforms to communicate and interact to expand their outreach and open up market boundaries. Deepening convergence will be one of the major driving forces behind the adoption and usage of technology in financial inclusion but a broader discussion about interoperability needs to start first. And I hope it happens in 2014. Video archives of selected sessions at the 2013 AFI Global Policy Forum are available. Click here to watch.